The late great Who bassist John Entwistle was legendary for his ability to get lost in the crowd. While Roger Daltrey would prance about, twirling his microphone and showing off his glistening chest, Pete Townshend and Keith Moon would wreak havoc on their instruments, reducing the band's equipment to rubble. But Entwistle was content to hang back on the side of the stage, stoically, seemingly impervious to the mayhem around him. He acknowledged his knack for avoiding the spotlight, referring to himself as "The Quiet One." There's a Quiet One in every band. The Rolling Stones had Bill Wyman. Led Zeppelin had John Paul Jones. The Beatles had George Harrison. There are three Quiet Ones in Coldplay. The Brit-pop darlings, who headlined Alice@97.3's annual Alice in Winterland show at Bimbo's 365 Club on Monday night, have dazzled American audiences with the lush, acoustical prettiness of their first two albums, Parchutes (2000) and A Rush of Blood to the Head (2002). Along the way, they've earned more than a few comparisons to alt-rock stalwarts Radiohead and U2, high praise indeed for a working-class quartet originally formed in 1998 by four University College, London, students looking to blow off a little steam. 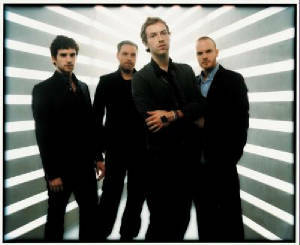 If Coldplay's soaring melodies andd majestic anthems justify those comparisons, their live performances do not -- yet. Perhaps that shouldn't come as a surprise. It took Radiohead and U2 years to develop stage presence, and precious though they may be, Coldplay needs time to do that as well. Scampering about the stage, a lone spotlight shining down on him while his bandmates toil in the shadows, Martin is clearly the driving force behind Coldplay, at least as a live entity. His intensity, most notable during spirited takes on "Clock" and "God Put a Smile Upon Your Face," is in obvious contrast to the Quiet Ones, guitarist John Buckland, bassist Guy Berryman and drummer Will Champion -- though, to be fair, Buckland is given to the occasional dramatic spasm during his most searing solos.